* Stop #13 of my 2016 Burger Love adventure. 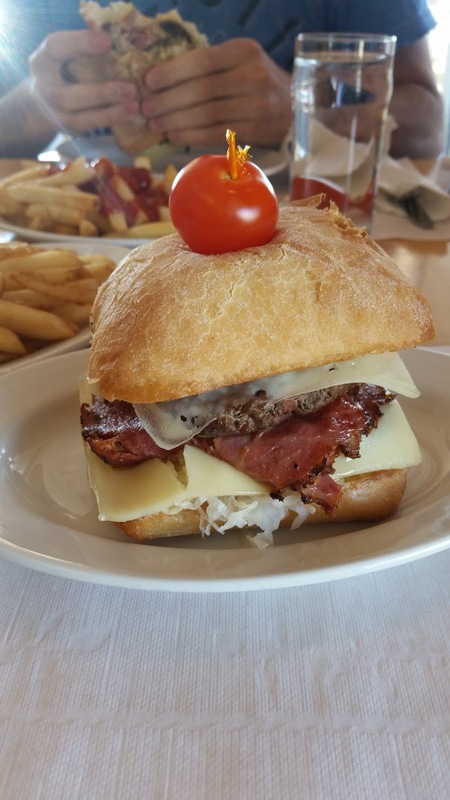 Our regular Friday lunch group has been sampling the various burger creations around Summerside so this week we stopped at the Silver Fox Yacht club. Their burger was a 6oz Island Beef Patty, Montreal Smoked Meat, Swiss Cheese, Dijon Mustard, Sauerkraut, Portobello Mushroom, and Hot Banana Peppers on a Buttered and Grilled Ciabatta Bun. Well, I knew I likely wasn't going to like this one since I normally don't eat sauerkraut or hot peppers, plus I don't eat smoked meat too often. So all that being said this burger didn't really stand much of a chance. With 73 different burgers out there I knew there would be a handful that I wouldn't like. Unfortunately this was one of them, the flavours weren't something I would normally ever eat.